That’s Chief Executive Barbara Stocking, as quoted by the BBC. Apparently the charity’s been doing some polling recently (in the UK), and coming up with interesting results. In one poll half of the respondents confessed that Africa conjured for them images of hunger, famine and poverty. In another poll, almost half of the 2,000 respondents thought Africa’s biggest challenge was hunger. Three out of four were suffering from ‘Africa-fatigue’ – that debilitating condition that afflicts well-meaning foreign philanthropists exposed to an endless stream of images of suffering and torment originating from the dark continent. A distressed Oxfam has since gone ahead to launch its latest Africa campaign, in a desperate bid to shift the world’s attention from African Hunger, to African-Hunger-Backdropped-By-Stunning-African-Landscapes. That’s, in a nutshell, the story. It left me a tad puzzled. A w-t-f puzzlement. As in: is Oxfam for real? Let’s even forget, for a moment, the unforgettable fact that Oxfam has probably done far more than any other organisation in propagating these images. Let’s focus on something else that struck me about the story: the way blame is being placed squarely on the shoulders of The Images. 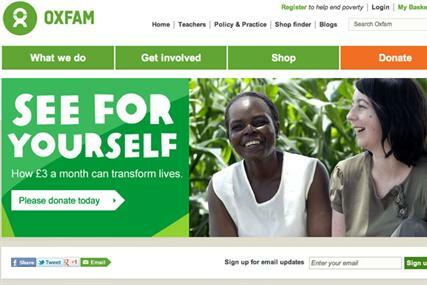 Oxfam appears to be saying: Put All The Blame On The Images. Not the people hanging on stubbornly to those images in the face of alternative evidence. Am I alone in thinking Oxfam’s lamentations suggest a British public that is at the mercy of what they are fed. Oh poor helpless people of Britain, all they’re being fed is harrowing, unhelpful images of Africa. We need to stop that. We need to feed them something different. We need to change their diet. The whole set-up suggests that Britain is now guilty of the sort of intellectual laziness once associated (almost solely) with America (er, sorry). Clearly the surveys say far more about the British mind than they do about the African condition. Now we know, courtesy of Oxfam, that all along we’ve been depending on a bunch of wallet-opening puppets to deliver us from ourselves. Now the puppets are growing weary, the strings fraying, the wallet-opening mechanisms aging. Now we have to refurbish the puppets, oil the creaking joints with a new, more positive type of ‘communication’. Landscapes, not Hunger! A mindset that elevates what the British public thinks of Africa, over and above contemporary reality, and that suggests that it is in Africa’s interest for that thinking to change, is not only faulty but dangerous as well. To put it less mildly, who — apart from Oxfam, obviously — really cares, in 2012, what the British public thinks about a continent from which they fled in varying stages of undress a half-century ago? What’s that proverb about crying more than the bereaved? In the 21st century are people still allowed to be zombies gobbling up everything they’re fed by a collaboration of powerful media and NGOs? I seriously doubt that it is in Africa’s interest for Brits to change their perception of Africa. Instead I think it is totally in Britain’s interests to change its perceptions of Africa. That problem, is Britain’s, and no one else’s. If the Brits insists on seeing Africa primarily through the lens of philanthropic intervention, in 2012, good for them. Let them stay thinking that way; let Oxfam, with its its Africa-emblazoned super-hero capes, stay convincing itself that it has a duty to alter global perceptions of Africa, while the Russians and Chinese — and diaspora Africans, who must have once assumed they’d left the continent for good — boldly head out to the continent to engage in potentially more useful ways. Granted that those starving-children-and-dying-mothers images form a sizable part of African exports to the West. There may be little we can do about that, as long as we have a West obsessed with delivering Africa from itself. But what about the the tens of thousands of kwashiorkor-free, English-speaking, pocket-money-receiving African students who flock to the UK annually, to study (with a good number actually returning, to continue with the lives they left behind in Lagos and Nairobi and Accra and Freetown and Johannesburg etc). How the British public fails to permit these alternative images to displace some of the “old stereotypes” (quoting Dame Stocking) should alarm many right-thinking people, and perhaps inspire an industry of academic theses on national delusions and epidemics of ostrich-in-sand-syndromes. If those flesh-and-blood representations of contemporary Africa somehow don’t succeed in serving as a useful counterbalance to the stereotypes, then nothing will. “We want to make sure people have a really better balanced picture of what’s happening in Africa. Of course we have to show what the reality is in the situations in those countries. But we also need to show the other places where things are actually changing, where things are different,” Dame Stocking says. I wish her and Oxfam the very best. Must be awful to have to take on that job of saving people from self-inflicted ignorance. In an age in which Google, Twitter and the news media lie at most fingertips, delivering, alongside stories of African suffering, narratives of determined recovery from tragedy and technology-driven change and emboldened youth and rising political awareness and growing intolerance for tyranny – is there still room for getting way with blaming with fixating on photos of begging bowls and the oxfamished children attached to them? I might also add that this is not to disparage the useful work that Oxfam has done and is still doing across the continent. The effects of aid, like AIDS, are real, no doubt. George W. Bush’s PEPFAR saved, and continues to save, millions of Africans lives. But stories also abound of the startling stupidities and failures of aid projects whose origins lie in a mentality belonging to a world that appears to have vanished. Misguided Messiahs and their T-shirt donation and Shoe donation schemes, money-grabbing consultants, corrupt practices, high-profile-nil-value baby adoptions, etc etc. You could of course argue that that is oil-rich Nigeria, and choose instead to focus on the Rwandas and Malawis where close to half the national budgets are donor-funded. And I could remind you of what the late Malawian President did with chunks of his country’s money. Or the mystery of the vanishing dollars in the Ugandan Prime Minister’s office. I’m also somewhat surprised we’re still having this ‘African aid’ argument at the end of 2012, after the eloquent arguments of books like Dead Aid and The Fastest Billion. And after the Economist already publicly regretted its silliness. Is Oxfam stuck on a planet that no longer exists? Watch out for Part 2 of this piece, focusing on how Oxfam can shift its focus from cajoling donation-weary Westerners and tap into African wealth to fund its Africa-transformation drive (not kidding).